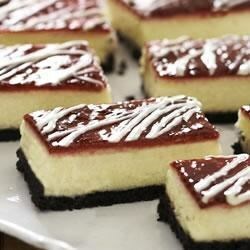 "Classic cheesecake bars become a touch more elegant with a white chocolate filling. A layer of raspberry preserves and drizzle of white chocolate take them over the top." Mix cookie crumbs and butter; press onto bottom of 8- or 9-inch square pan. Melt 2 ounces chocolate as directed on package. Bake 25 to 28 minutes or until center is almost set. Cool 5 minutes; spread with preserves. Melt remaining chocolate; drizzle over cheesecake. Cool cheesecake completely. Refrigerate 4 hours. Cut into 18 bars. How to Double Recipe: This recipe can be easily doubled. Prepare as directed, doubling all ingredients and baking in 13x9-inch pan. Makes 18 servings. I made this a couple of years ago after seeing it in Kraft magazine. Its easy and delicious,very rich though. It looked exactly as the picture. It tastes good as hell and really simple to make. The only thing is that mine sunk in and was way too wet. These are so delicious. When someone is planning a get-together, these are what they put me down for..So pretty,and not that difficult to make.I bring an empty dish home everytime. I would recommend adding the top white chocolate layer after cutting the cheesecake bars otherwise it cracks and doesn't look as nice as it could... But it sure is yummy!